Bootie finally presents an 18+ party, just in time for New Year's Eve! If you’re looking for a more intimate NYE party but with the same crazy fun mashups and energy, then come to DNA’s sister venue, Codeword! It’s time to say good riddance to 2016 and ring in 2017 with Bootie! Midnight countdown with confetti blasts! Bootie DJs spin the best mashups of the past year! Bootie finally presents an 18+ party, just in time for New Year’s Eve! So drop the attitude, pretense and high expectations, and ring in the New Year with Mini Bootie 18+! 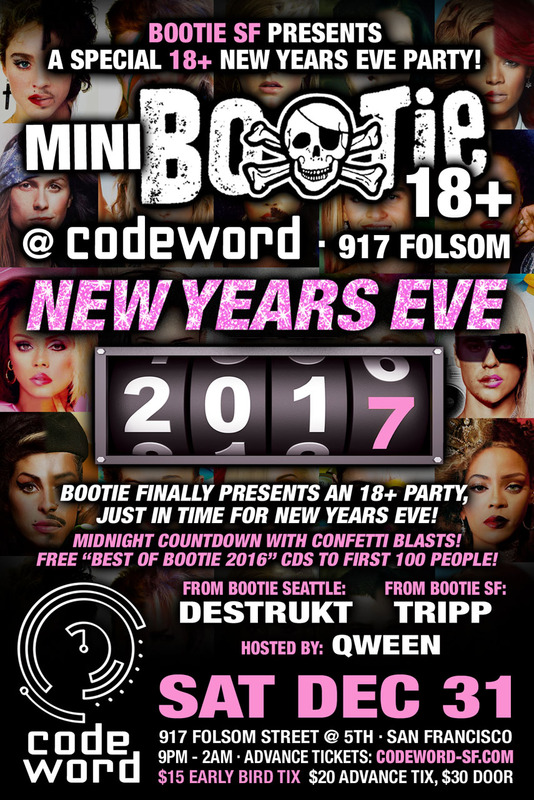 Special guest DJ Destrukt from Bootie Seattle joins Bootie SF’s own DJ Tripp to give you a shamelessly fun 18+ New Year’s Eve party at DNA’s sister venue, Codeword, spinning the best mashups from the past year to keep you dancing into the new one. Drag queen hostess Qween keeps the party going and leads the midnight countdown! All this, plus the much-awaited “Best of Bootie 2016” CD — our annual mashup mixtape compilation — FREE to the first 100 people through the door.